In 1916 the award of the King’s Gold Medal to Australian Naval Cadets was instituted at the Royal Australian Naval College, Jervis Bay as an incentive to young naval officers. At that time His Majesty King George V was the reigning British monarch. The medal was awarded annually to the Cadet Midshipman who, in the opinion of the captain of the college, was most deserving of the honour and displayed ‘gentlemanly bearing, character, good influence among his fellows and officer-like qualities’. The first Cadet to receive the coveted honour was Winn Lockyer Reilly in 1916. 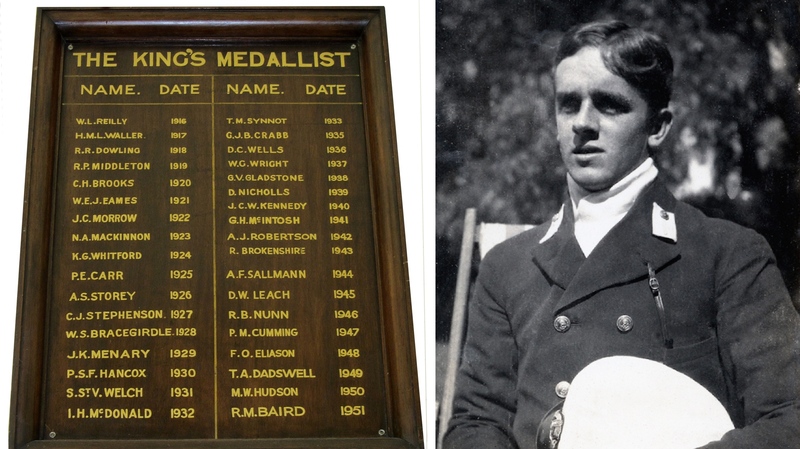 Each recipient of the award had their name enrolled on a board which, at Jervis Bay, was displayed in the gymnasium. Later, when the college relocated to Flinders Naval Depot, it was displayed in the cadet’s Gunroom. As a further mark of prestige the letters KM appeared following a recipients name in the Navy List. The medal, produced by the Royal Mint in the UK, depicted on the obverse the effigy of King George V surrounded by a legend in Latin evenly spaced around the face of the medal. The obverse and reverse of the King's Gold Medal. The reverse of the medal depicted a backdrop of a sprig of wattle and oak leaves with the central shield of the Australian coat of arms in the foreground. The words ‘His Majesty the King’s Medal’ appeared in raised lettering in an arch at the top of the medal while the inscription ‘Royal Australian Naval College’ was added to the face of the reverse. After the death of King George V in 1936 the obverse of the King’s medal was altered to reflect the bust and legend of King George VI. The King's medal awarded to TA Dadswell in 1949 showing the effigy of King George VI on the obverse. Following the ascension of Queen Elizabeth II to the throne in 1952 the award was retitled the Queen’s Medal. Both the obverse and reverse of the medal were altered to reflect this change. An effigy of Queen Elizabeth II wearing a wreath was adopted on the obverse along with the legend: ELIZABETH II DEI GRATIA REGINA FD, meaning: Elizabeth II, by the grace of God, Queen and Defender of the Faith. 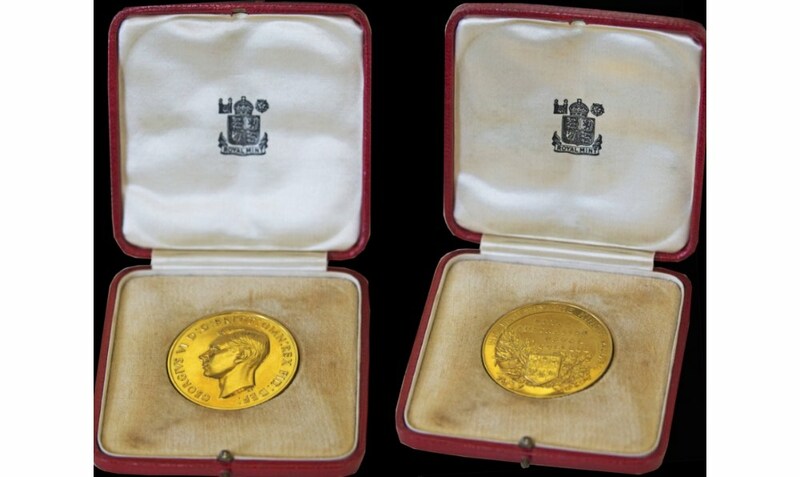 The obverse and reverse of the Queen's Gold Medal. In keeping in step with society the provisions concerning the award of the medal have changed over the years and today the medal is presented annually to the officer who has exhibited exemplary conduct, performance of duty and a high level of achievement whilst undergoing initial training and application courses. The inaugural winner of the King's Gold Medal, Midshipman WL Reilly, RAN. 1932 winner Lieutenant IH McDonald and 1957 winner Midshipman RG Taylor. 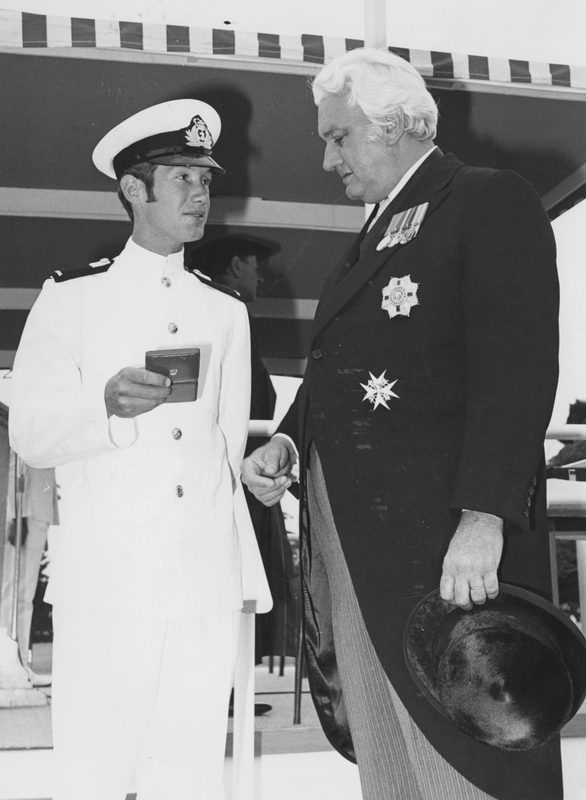 The Governor-General, Sir Paul Hasluck, speaking with Sub-Lieutenant SN Howlett after presenting him with the 1971 Queen's Gold Medal. 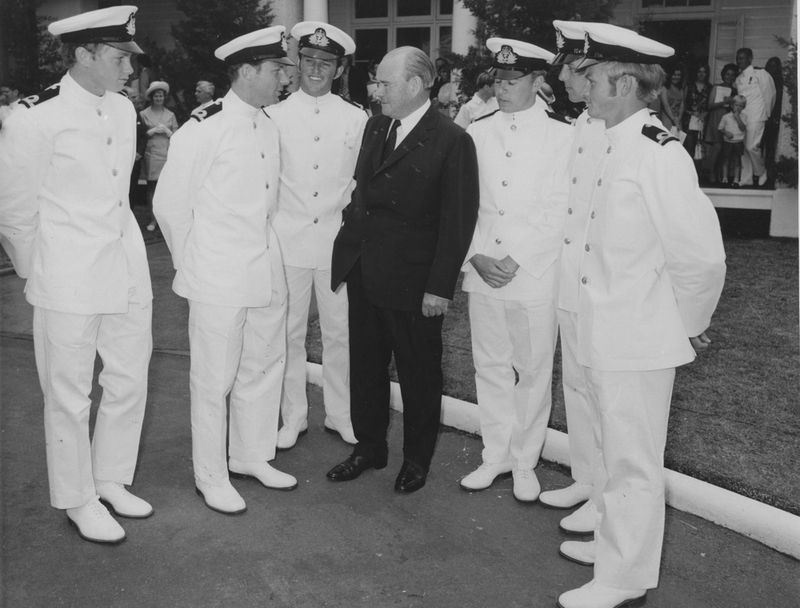 L-R: SBLT J Young, SBLT S Howlett, Governor General, SBLT R Shalders, SBLT R Sharpe, SBLT B Cook, SBLT R Swinnerton. 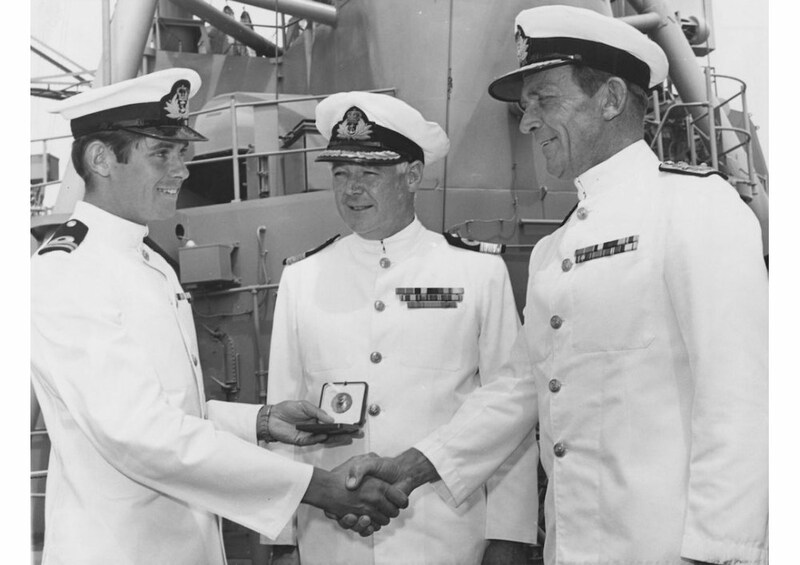 Rear Admiral GJB Crabb (right) the then Flag Officer Commanding East Australia Area, congratulates Lieutenant David Ramsay of the destroyer HMAS Brisbane on receiving a Royal Navy Queen's gold medal in Sydney on the 24th of October 1971. 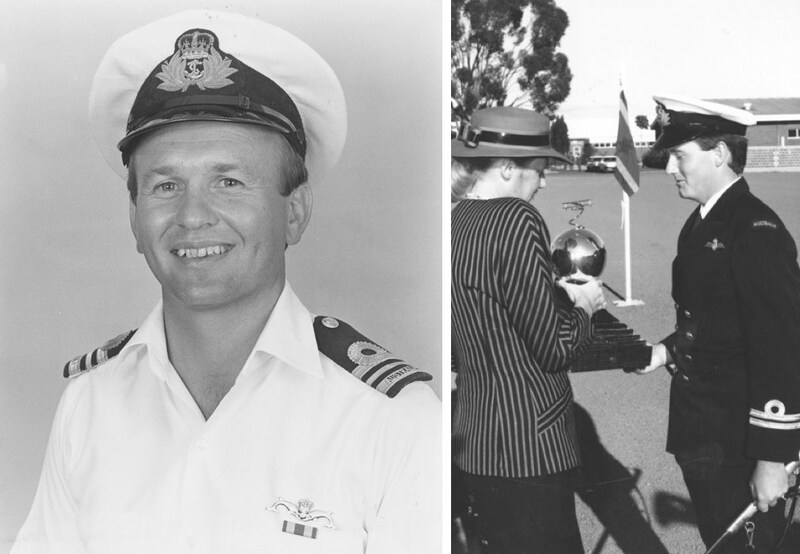 Lieutenant Ramsay was the son of the then Naval Officer Commanding West Australia, Commodore JM Ramsay (centre). He entered the Navy in January, 1963. During his time in the United Kingdom he obtained best overall marks in his final year of initial training for seaman and supply officers in 1968. 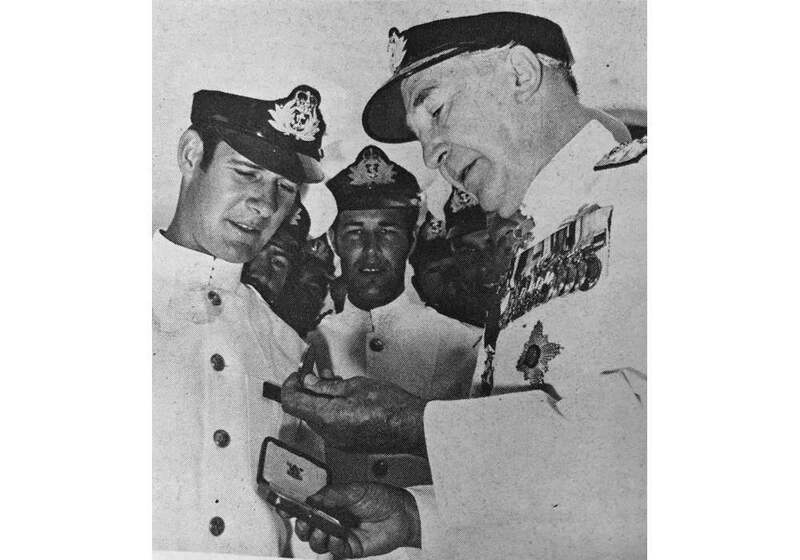 Vice Admiral Sir Victor Smith admires a Queen's Gold Medal awrded to Midshipman Alan John Graham following a promotion parade in 1972. Cadet Midshipman MA Hudson receiving the Queen's Gold Medal from Sir John Kerr in 1974. 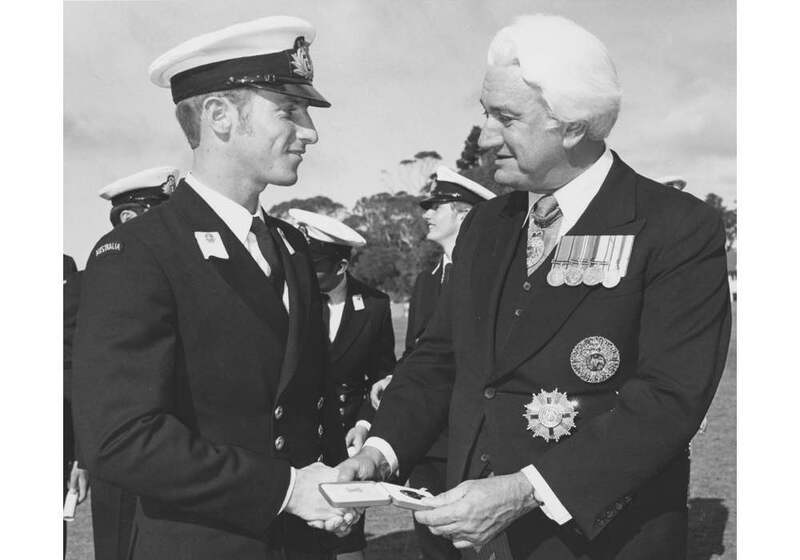 1977 Queen's Gold Medal winner Midshipman Guy James accepts his award from the Governor General Sir John Kerr. Left: 1973 winner Lieutenant Commander JC Stanbury. Right: 1984 winner Lieutenant CJ Gaudie, RAN. 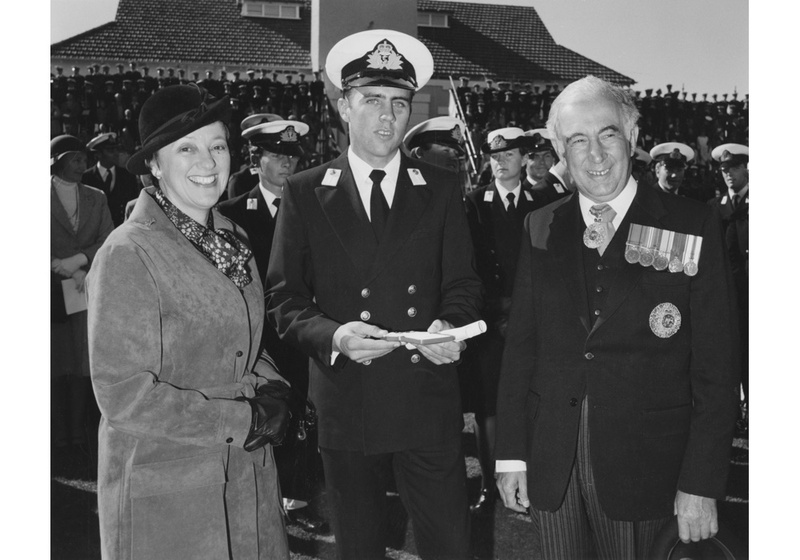 Queen's Gold Medal winner and Dux of the Creswell course, Midshipman Robert Morrison, with Governor-General Sir Zelman Cowen and Lady Cowen in 1980. 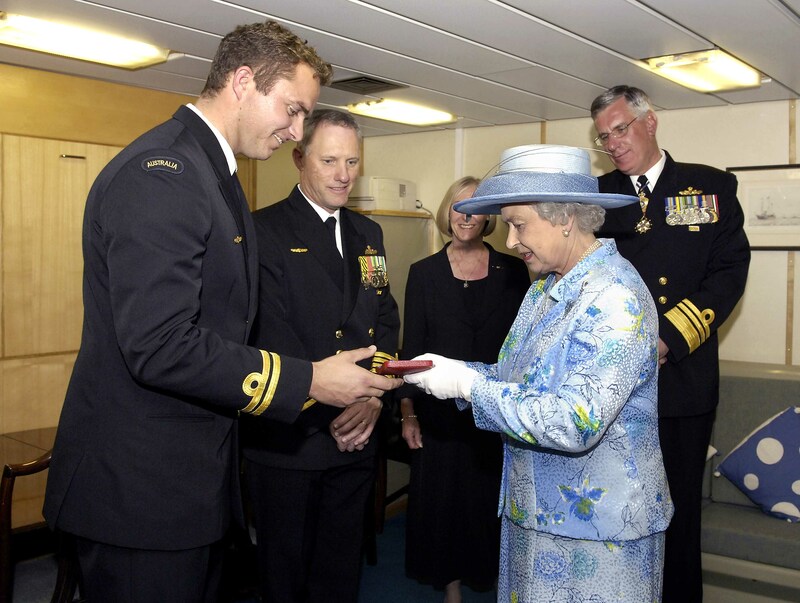 Lieutenant Arno Tielens receives the Queen's Gold Medal for Trainee Officer of the Year 2004 from Her Majesty, Queen Elizabeth II. Also pictured is the Commanding Officer of HMAS Anzac, Captain Richard Menhinick (centre), the Australian Chief of Navy, Vice Admiral Chris Ritchie and his wife Julia. 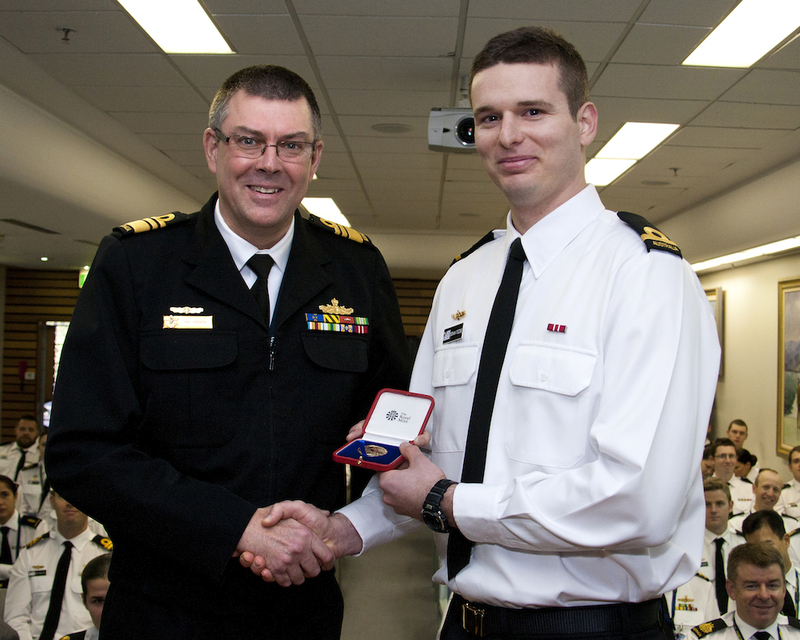 Vice Admiral Ray Griggs AO, CSC, RAN, Chief of Navy presents Sub Lieutenant Boman Trezise RAN, with Her Majesty the Queen's Gold Medal for his outstanding performance during Junior Warfare Application Course Phase III. Left: Vice Admiral Russell Crane, AO, CSM, RAN, presents Lieutenant Andrew Davies, the 2009 Queens Gold Medal winner, with his award onboard HMAS Sydney. Right: The 2013 Queen’s Gold Medal recipient, Lieutenant Lauren Ruse, with her medal in the grounds of HMAS Creswell. 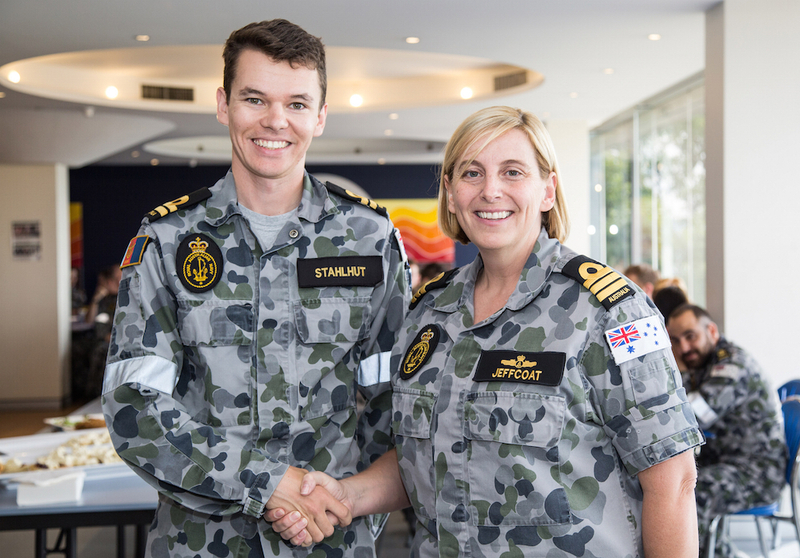 Commanding Officer HMAS Kuttabul Commander Rebecca Jeffcoat, RAN, congratulates Lieutenant James Stahlhut on becoming a Queen’s Gold Medal winner 2015. Left: Vice Admiral RH Crane, AO, CSM, RAN, the then Chief of Navy, looks on following the presentation of a replacement King's Gold Medal to the 1937 receipient, Captain Graham Wright, RAN (Retd) by the former Governor-General of Australia, Dame Quentin Bryce, AD, CVO in December 2008. 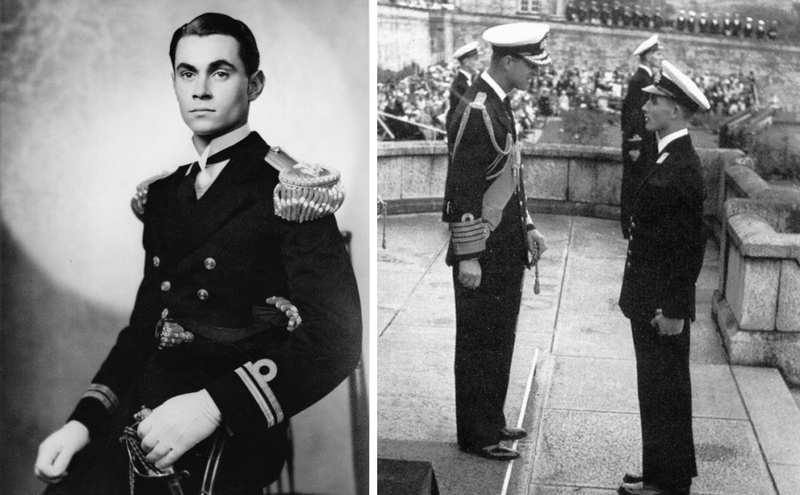 Right: Commodore TA Dadswell, AM, RAN (Retd) with the King's Medal he was awarded in 1949.